Written by Shayla Price on March 2, 2018 . What makes an effective transactional email? This question rests on a lot of marketing managers’ minds. The correct answer can increase your open and click-through rates. In return, gaining your business more customer engagement and possibly sales. While no right or wrong answer exists, there are a few transactional email best practices you can try. It’s up to your team to experiment and figure out the right formula for your customers. The goal remains the same: strengthen your lifecycle campaigns. The following strategies offer a starting point for your team. Every email sent to customers is an opportunity to build a better relationship. The first objective of a transactional email is to achieve a desired action, such as confirming an email address or updating credit card details. The secondary goal is to satisfy the customer, making the recipient feel valued. The best transactional emails accomplish two duties: Informative emails serve the intended purpose of the message. For instance, the invoice email contains billing details. As for the delight aspect, you need to offer something in return for the customer’s time and attention. Perhaps, the email has a beautiful design, a funny GIF, or a helpful resource. When you send an email is just important as the contents of the email. If you deliver a message too late, you risk losing the attention of the recipient. That’s why, timing is often an overlooked transactional email best practice. We just assume that all the behind-the-scenes magic happens on its own. But it doesn’t. Marketing and engineer teams must work together to configure the triggers to deliver your password reset emails and shipping confirmations. Customer.io simplifies this process, allowing you to set up event triggered campaigns. Let’s say you want to send a unique cancellation email to all churning customers who didn’t give a reason for cancelling. (It happens to the best of us.) You can set up a campaign to trigger only when an event matches “plan_canceled.” Then, you can filter the event data to include only users with no value in the event attribute labeled “reason.” This method ensures the right person gets your message. Click for larger image The workflow section is where you can decide when a user receives your cancellation email. Our platform gives teams the flexibility to add delays and time windows. In the case below, once a user matches the trigger conditions, she will enter a 12 minute delay. Then, the email will only send in a time window that matches a weekday between 8:00 am and 7:00 pm Pacific Standard Time. Click for larger image There’s no reason timing should falter your lifecycle campaigns. Timely transactional emails impact the customer experience. When it comes to subject lines in transactional emails, it’s best to err on the side of function than creativity. 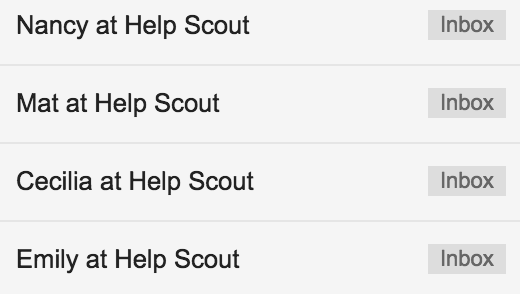 A wacky subject line could easily confuse the recipient, or worse, get marked as spam. Focus your efforts on giving customers recognizable language. Take a look at the Orbitz subject line example below. The customer can easily spot the purpose of the email: to confirm travel arrangements. The booking site even includes the specific itinerary number. If word character count keeps you up at night, we have good news to share. 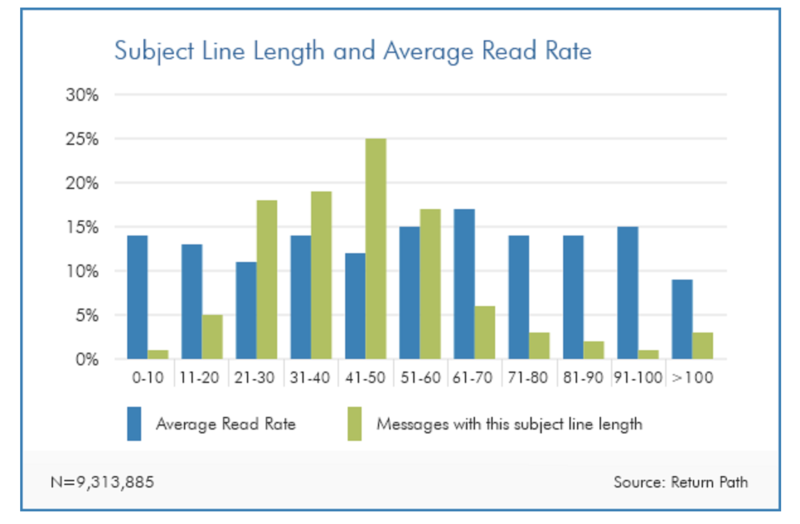 Return Path found that “subject lines of 61 to 70 characters had a 17% average read rate.” That’s the highest of any length. Image Source Avoid the elaborate and often times misleading verbiage. You can increase your open rates with a straightforward subject line. Remember the time when Caller ID didn’t exist? People answered nearly every phone call to ensure they didn’t miss an important call. Then, after the introduction of Caller ID, people started screening their calls. If they didn’t recognize the phone number, the individual didn’t answer the call. In a similar fashion, email recipients screen their messages. If an unfamiliar name pops up, your transactional email will remain unopened. You can increase your open rates by tailoring your “From” name. For instance, all billing messages come from “John @ Apple” and all your product updates will be from “Mary with Google.” Help Scout spotlights a good example of this strategy: You also may want to experiment with a more informative “From” name, like “Billing at Customer.io.” At the very least, anything is better than a no-reply address. Our friends at Zapier showcase this format nicely in this alert email. This transactional email is helpful and states its purpose immediately: to save customers the pain of getting locked out of their accounts. Image Source The copy doesn’t sound like a robot wrote it. 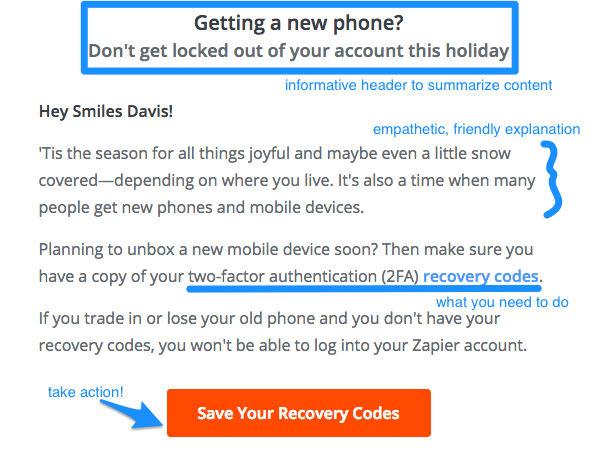 The Zapier team uses an empathetic explanation to convey what they need from the customer. Then, the orange call-to-action button guides customers to take action. This simple format ensures that your copy communicates a clear message. Then, you can add hints of brand personality to delight the customer. The message uses an eye-catching yellow. This color connotes cheerfulness—perfect for building urgency without being aggressive. The lock icon and confetti add a touch of playfulness while serving as a way to inform the recipient of the purpose of the email. The big call-to-action button is impossible to miss and contains only two words. 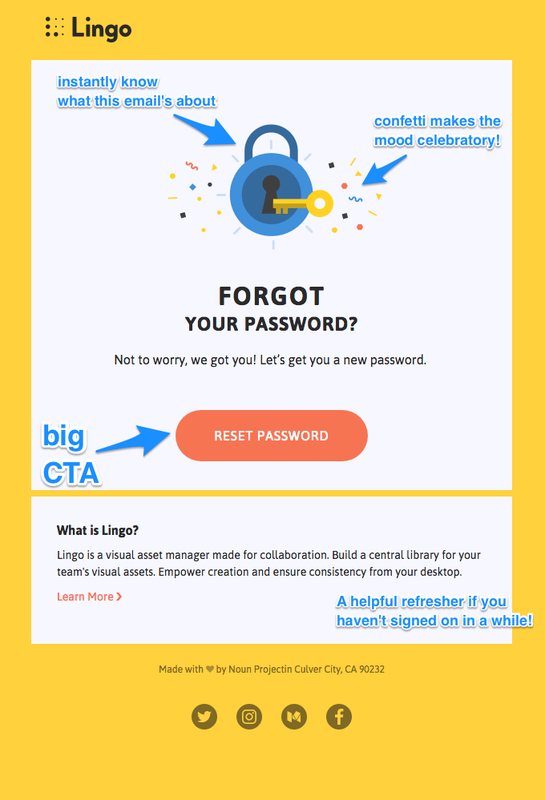 The “What is Lingo?” section is separate from the main content of the email, but still easy to read. Image Source Treat design as an extension of your copy and consider how you can communicate key information faster. Every day, businesses conjure up ways to differentiate themselves from their competitors. There’s the stage where companies add a new product feature every week. Then, there’s the moment when businesses craft a homepage with 50+ buzzwords. These tactics work for awhile, but customers get schooled to the gimmick and move to the competition anyway. To rise above it all, direct your attention to delivering excellent customer service. This strategy translates into answering customers’ questions and being an expert source for your audience. Transactional emails can help facilitate this experience. Whether you’re sending a welcome message or a dunning email, you’ll want to give customers your contact information. Flagstar Bank states where their customers can receive help in this payment confirmation email. The financial institution offers a phone number and email address. Plus, their team lists the hours of operation. Click for larger image You never want customers guessing how to contact your team. It’s vital that you make your contact details readily available. Transactional emails drive action. To help your customers accomplish key tasks, you need to create a path toward success. Experiment with these best practices to build your own lifecycle campaigns. How do you optimize your messages? Share your transactional email best practices in the comments.